We, the Guyanese people, this year, celebrate the Independence we gained fifty years ago on 26th May 1966. We were inspired then by our national motto – ‘One People, One Nation, One Destiny’. We are encouraged now by our efforts to make that motto a reality. We renew our pledge to make our cherished homeland a place of unity, security and prosperity. We, Guyanese, commemorate this 50th anniversary of our nation’s Independence – our ‘quinquagenary’ – with determination to improve our citizens’ quality of life, to transform our national economy and to pursue a path to progress. 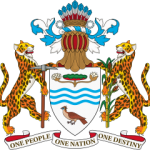 Guyana became independent after 350 years of Dutch and British imperial rule. The new nation was born under a state of emergency. The acrid odour of civil conflict hung like a pall over the land. The vista of divided villages scarred the landscape. The voices of disunity and enmity echoed in marketplaces and bottom-houses. We had a new name, a new national anthem, a new flag, a new coat-of-arms, new passports, new postage stamps, new coinage, a new Constitution and a new National Assembly. Those new symbols did not make us independent. We were very much still British Guiana on the night of 25th of May 1966. The Governor-General, the titular representative of the British Queen, was a foreigner. 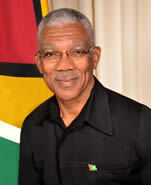 The Chief of Staff of the Guyana Defence Force was a foreigner. 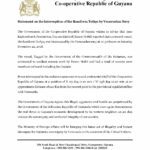 The Commissioner of the Guyana Police Force was a foreigner. 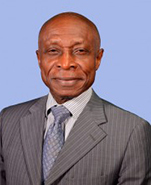 The Governor of the Bank of Guyana was a foreigner. 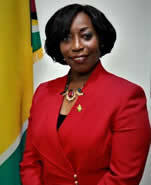 The Vice-Chancellor of the University of Guyana was a foreigner. The Anglican Bishop of Guyana was a foreigner. The Roman Catholic Bishop of Guyana was a foreigner. The major industries – bauxite and sugar and the banking system – were in the hands of foreigners. We became an independent state by appellation but remained a dependent economy in actuality. Political Independence was neither the work of one person nor one party nor was it a sudden event. It was a process that took place over a long period of several decades. It was the climax of a popular movement. Legislators, workers, ex-servicemen and ordinary people agitated to achieve political Independence. We are heirs of their efforts, successors to their struggles and, now, possessors of their patrimony. Political Independence did not come easily or cheaply. It came only after decades of distress, distrust and, tragically, deaths. Let us not now dwell on the pain of the past but look with faith to the future. Let the sacrifice of those who struggled and died inspire us today and guide generations to cometomorrow and beyond. Political Independence meant change. It meant, at the collective level, a change from colony to nation. It meant, at the individual and at the psychological level, a change from subject to citizen, and from discrimination to dignity and equality. Statehood, however, meant more than political change. Our first Prime Minister, Forbes Burnham, wisely advised: “Independence … is a means towards an end. The end must be the changing of our society and the revolutionising of the economy”. Changing the name of a country was simple matter. Revolutionising the economy, indeed, was a difficult and never-ending process. This Year – 2016 – is an opportunity to hasten our economic development. Our Golden Jubilee year presents us with the challenge of renewing the ‘Independence Covenant’ and of rekindling the enterprising ‘spirit of 26th May.’ This year has been designated the ‘Year of Renaissance.’ It will be devoted to the rebirth and the renewal of the promise of economic independence and resilience. We became independent and made a covenant among ourselves that we would, in a free state, aspire to enjoy a better life than we had to endure in a colony. We toiled to repair a country that had been damaged by disunity and division. We strove to create a community of comity and unity. We sought to satisfy the needs of our people by expanding public education, health, communications and transportation services. We erected an airport, bridges, highways, housing schemes, schools and a university. We established new national institutions such as our Ombudsman and our own Court of Appeal. We created a credible Foreign Service and cemented international friendships and alliances to secure our territory from external aggression. We contributed to the establishment of CARIFTA CARICOM and the ACP. We took our place in the international community. Independent statehood vested us with the responsibility of being guardians of our territory, custodians of our national patrimony and masters of our own destiny. Our new status imposed an obligation to improve our citizens’ access to public services. Independence promised expanded opportunities and enhanced security. It engendered hopes of a ‘good life’ for all. The fulfilment of these hopes rested, in part, on the new nation’s capability to build a resilient economy upon the remnants of the old order. The old colonial economy had produced an army of landless and impoverished peasants and workers. It had consigned the mass of our people to an existence of persistent poverty. It had doomed our country to a destiny of dependency. The new state was expected to surmount the legacy and impediments of three and a half centuries of economic exploitation. It was expected to educate masses of unemployed young people; to enhance the productive capacity of workers; to eradicate poverty and to ensure everyone’s well-being. These have not been easy tasks. The old economy was dominated by six commodities – rice, sugar, bauxite, gold, diamonds and timber. Excessive economic dependence on the export earnings of these six primary commodities exposed us to the volatilities of global commodity prices. The old economy was susceptible to external shocks. The ‘Independence Covenant,’ therefore, remains unconsummated. Our task today is to complete our mission by securing, within the next decade, a ‘good life’ for all Guyanese. The necessity of economic transformation cannot be denied or delayed. We must act resolutely to implement the reforms that are essential to building a resilient economy — one that is adaptive to the changes and responsive to the challenges of the global economy. We must, in so doing, recognise some of the other impediments imposed by the circumstances under which we attained Independence fifty years ago. These impediments must now be overcome if we are to achieve the economic basis for a higher quality of life. We are proud of our accomplishments since achieving political Independence over the past fifty years. We now look forward to the achievement of economic independence over the next fifty. We shall be prouder when we employ our energies and efforts in this special year of our ‘national renaissance’ to remove the remaining obstacles that still keep us disunited, and to chart a course that will bring happiness to our people. It is now time to set forth on a new pathway to progress. It is time for a fresh start – a new beginning. It is time to redouble our efforts to eradicate poverty. Our government is committed to promoting sustained economic growth with enhanced distributive justice so that inequalities are reduced and opportunities are increased. Our vision is for every Guyanese to be able to enjoy a ‘good life.’ Achieving a ‘good life’ is not a wish or a dream. It requires greater equality of opportunity in order to attain economic growth. A ‘good life’ is about removing inequalities and providing opportunities for every citizen to be the best he or she can be. It is in pursuit of achieving greater economic independence that we have reconfigured an executive cabinet to give leadership to the renewed national effort to rebuild our economy. It is for this purpose that we have come to the Legislative branch of government to appeal for collaboration in our common pursuit of economic independence. The Executive and Legislative branches, together, can continue to pursue policies which emphasize economic openness and competitiveness. We can, together, continue to seek investment for the sustainable development of our natural resources. We can, together, ensure that the benefits of the exploitation of these resources redound to enhancing the quality of life of all Guyanese. The Ministry of the Presidency has been reconfigured to combine the offices of the President, Vice-President and Prime Minister and Ministers of State, Citizenship and Social Cohesion. This combination enhances governance and, especially through the Office of the Prime Minister, manages the government’s business and legislative agenda in the National Assembly. Our Ministry of Social Cohesion, a Ministry within the Ministry of the Presidency, will continue its arduous work to reinforce national unity. We can be one nation only if all sections of our population feel that they share in our country’s economic development. We must, in 2016, dispel enmity among individuals and groups. We must move forward as a united nation. Colonial rule fomented divisions of race, religion and region which have imposed a big burden on the slender shoulders of our small society. These divisions, for fifty years, have frustrated our economic development, making national unity elusive. National unity does not preclude the existence of differences in philosophies or opinions. It does include a willingness to respect each other’s rights. 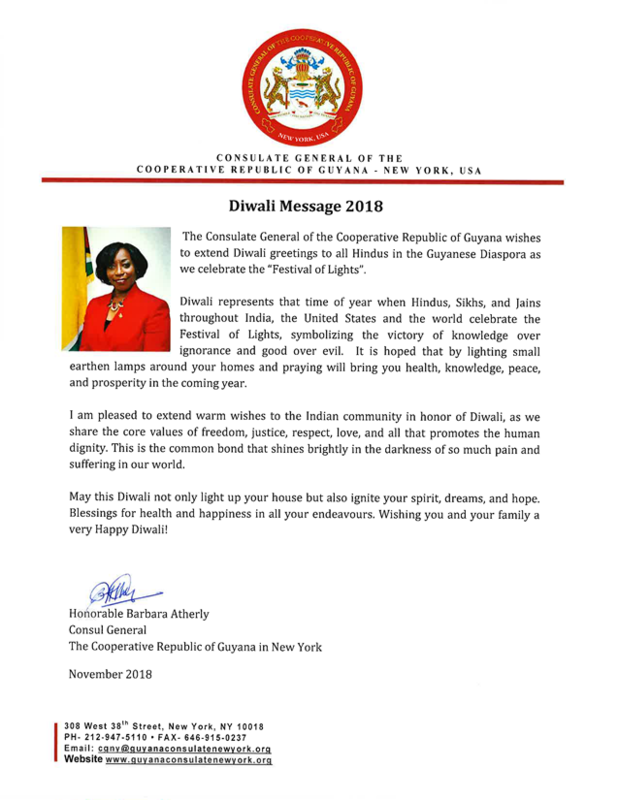 Our Golden Jubilee is a propitious moment for all Guyanese to put an end to hateful and unhelpful political discord, disaffection and disunity. Our Golden Jubilee is a golden opportunity for us to cement national unity at the political level and at the economic level. Our Ministry of Citizenship, a Ministry with the Ministry of the Presidency, will implement systems to ensure that every Guyanese child’s birth is registered and will develop policies to ensure greater control over illegal aliens. The Ministry, in this era of global terrorist threats and transnational crime, will work with the Ministries of Foreign Affairs, Public Security and Social Protection to confront the challenges of international terrorism, migration and trafficking in persons. The provision of public services is an essential and indispensible function of our government. Public services build public trust through common access, fairness, timeliness and usefulness. Public services play a vital role in creating an enabling environment for businesses and the efficient functioning of markets. The quality of public services determines citizens’ quality of life. We will continue to reengineer government to ensure that our public services are accessible by all citizens this year. Public services must be people-friendly. Public servants must be trained and ‘unbribable’. We shall continue to reform the Public Service to enhance its efficiency and assure its integrity. We have recruited a resourceful team of fourteen ‘line’ ministers from our six-party coalition for the purpose of promoting economic growth. Our Ministry of Business will improve the ease of doing business; attract increased foreign and local investment; support the development and export of value-added industries and products; support industrial development through the establishment of industrial estates; encourage small- and micro-enterprises and revitalise our village economies. It will continue to support the traditional sectors of the economy and create favourable conditions for investors. We will pursue economic diversification, augment value-added industries and introduce new developmental portals. We will, also, reduce Guyana’s vulnerability by expanding the economy into the services sector and building strong tourism and hospitality industries by developing a diversified mix of tourism products. Our Ministry of Agriculture has been confronted with the reality that some traditional sectors which have been the mainstays of our economy are in a crisis. The sugar industry suffered serious setbacks. Rice is facing competition from other low-cost producers and its export markets are threatened. An agricultural diversification plan has to be launched. This must involve the restructuring of the traditional agricultural productive sectors. The plan is to diversify agriculture into new crops and to open up new areas of cultivation, particularly away from the flood-prone coastal plane. We will expand rice cultivation and establish a stabilisation fund for the export prices of rice. We will improve drainage and irrigation systems; strengthen the regulatory framework governing the fisheries sector and promote large-scale agriculture in the intermediate savannahs. Our Ministry of Finance, over the next decade, will develop policies and provide incentives, to encourage greater value-added activities in the productive sectors. This will ensure that our economy can be better insulated from external shocks. It will ensure that our young people benefit from the increased employment generated by greater value-added activities. It will ensure enforcement of the law through rigorous suppression of contraband smuggling and tax evasion. Our Ministry of Public Telecommunications, formally established at the start of the year, is evidence of our government’s commitment to a digital economy as a new portal of development. Data and information and communications technologies, increasingly, will become drivers of economic growth. They will allow us to develop new products and services, improve competitiveness and transform the business, health and education sectors. We will ensure that more teachers, more students and more schools go online over the next decade. Our Ministry of Communities will move progressively towards reaffirming the primacy of local government and creating a ‘green economy’. Our efforts have started with cleaning up our environs to restore a sense of order and cleanliness to our communities and municipalities. Our determination to conduct local government elections, our decision to promote local democracy and our establishment of new towns to strengthen regions have opened a new chapter in public administration. Our Ministry of Education is committed to realigning our educational system so that it produces the skills necessary for economic transformation. It has become an article of faith of this administration that every child must go to school. It is our mission and our obligation to make universal primary and secondary education a total reality. We will use every resource at our disposal to ensure that every Guyanese child, in every part of the country, has access to transportation – by bicycle, boat or bus – to get to school. Guyana’s economic transformation over the next decade requires that we invest in a skilled and healthy workforce. It will also depend on our ability to deepen national unity and strengthen our national identity. We are committed to restoring national pride, fostering respect for our national symbols and monuments and protecting them from damage and degradation. We shall assert our identity and celebrate our achievements. Our Ministry of Social Protection will restore dignity of vulnerable groups, reduce gender disparities and protect the disabled. It will reduce major social ills such as child and elderly abuse, violence and sexual abuse, labour violations, suicide, trafficking in persons, youth crime and youth unemployment. It will provide support to those facing difficult circumstances. It will improve enforcement of employers’ obligations for national insurance protection for working people. It will also ensure safe working conditions for everyone and will suppress trafficking in persons. Our Ministry of Legal Affairs is committed to the independence of the judiciary and the autonomy of Constitutional offices. We shall defend the integrity and independence of our National Assembly. Independence requires the preservation of national institutions which promote “national identity and ensure a stable legal and constitutional environment.” We are committed to the strengthening of the institutions which were created as a consequence of Independence. We reaffirm our commitment to the supremacy of theConstitution. We reassure the nation of our support for the strengthening of the National Assembly as an essential pillar of democratic rule. Our Ministry of Public Infrastructure will extend our physical infrastructure in order to intensify integration and promote development. We will, at the same time, provide greater access to the resources of the hinterland which can be exploited for the benefit of all of our people. 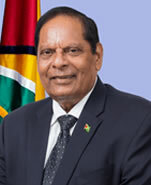 Political Independence was intended to benefit all Guyanese. 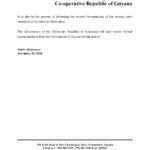 Independent Guyana is a unitary state. We are one nation. The challenge of Independence was to move forward as an undivided nation. Wide gaps have opened in income between rich and poor and in levels of development between rural and urban and between hinterland and coastland. A key objective of our government is the reduction of these inequalities by expanding infrastructure to promote geographical integration and economic inclusivity. Integration and inclusivity, in turn, impact positively on reducing inequalities. Our Government, this year, 2016, will continue to place emphasis on greater connectivity between coastland and hinterland and between rural and urban areas. Our economic programme for 2016 will include important investments in internal transport infrastructure – especially aerodromes, bridges, ferries and stellings. We will also support plans for the expansion of communications infrastructure so as to support existing and new investments. This year will see increased emphasis on investments in infrastructure to improve access to those areas where our natural resources are located and also to support the development and integration of the hinterland to the coastland. 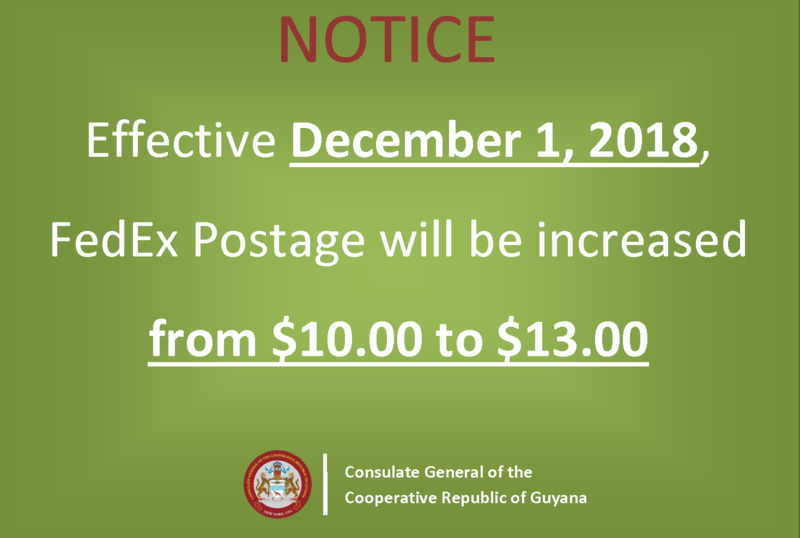 Our Ministry of Public Infrastructure will lead Guyana’s drive towards cheaper and cleaner forms of energy. Our economic transition towards developing a competitive manufacturing sector requires cheaper energy. Our country’s goal is to achieve a ‘green economy’ – one characterized by greater use and dispersion, throughout Guyana, of renewable sources of energy such as wind, solar and hydro power. We will pursue climate resilience as another portal of development. Climate change is an indisputable reality. Guyana, as a small, developing, low-lying coastal state, ignores the consequences of climate change at its peril. The rise in sea levels and the extremes of the weather, all associated with climate change, will present formidable challenges to our nation. Our infrastructure is incapable of coping with the consequences of flooding, drought and damage to our sea defences. We will, over the course of the next decade, be implementing a national climate resilience and adaptation strategy that includes disaster risk reduction measures. Our Ministry of Indigenous People’s Affairs will continue to play a pivotal role in protecting the livelihood of our indigenous peoples and promoting the development of their communities. It will improve educational access; reduce poverty through skills training and entrepreneurship; promote sustainable agriculture and community-based tourism; extend a hinterland energy programme with a strong bias towards use of renewable energy technologies. Our Ministry of Public Health will improve equity and quality in the delivery of primary health care through the strengthening of regional health systems. It will contribute to increased productivity by instituting a nation-wide system of accessible, quality health care. It will intensify its efforts to uncover the underlying personal and social causes of suicide. Our Ministry of Natural Resources will oversee the sustainable exploitation of our resources which require investments in infrastructure, particularly in the hinterland where our natural resources abound. We can open up our bountiful resources for development only if adequate infrastructure is in place. Independence bequeathed the resources of our country as the common patrimony of its citizens. Guyana’s natural resources need not be left idle. They can be exploited sustainably and in an environmentally-friendly manner for the benefit of all of our people. We will continue to improve the management of our natural resources in an environmentally conscious manner in order to ensure that our ecosystems make a contribution to global climate change solutions and the protection of our citizens. Independence imposed the obligation on the state to secure its borders and to ensure the safety of its citizens. 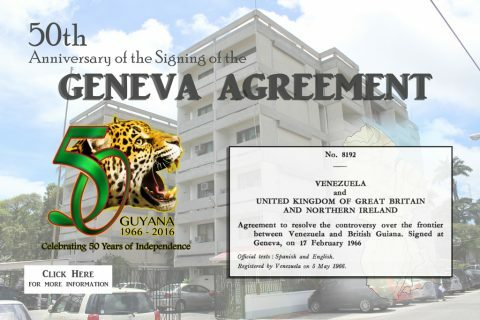 Our Ministry of Foreign Affairs will continue to advance Guyana’s economic interests and secure protection for the defence of our territorial integrity within the international community. 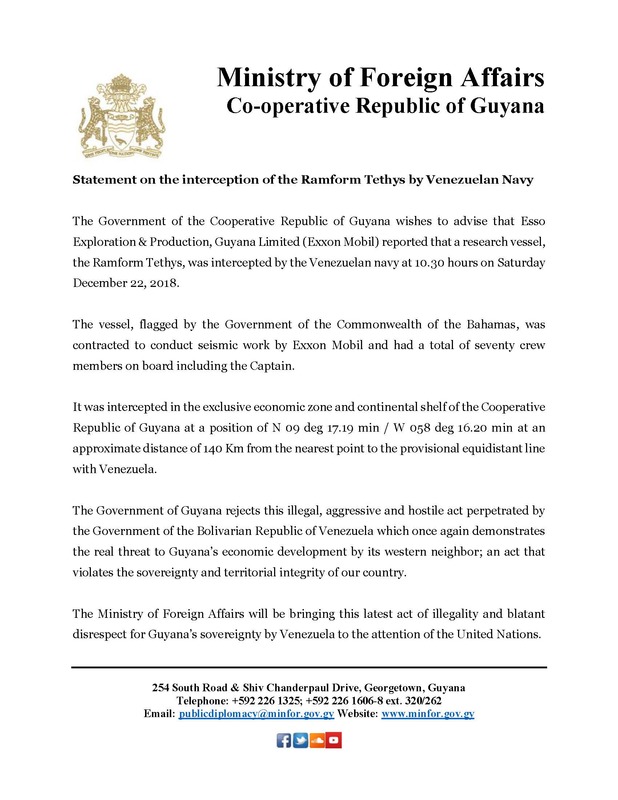 Guyana will continue to reinforce national security in order to protect the country’s patrimony in the face of threats by working with the Secretary General of the United Nations to seek a swift juridical solution to the spurious claim of the Bolivarian Republic of Venezuela to our territory. Our government will continue to exercise vigilance over our territory and sea space. We will continue to advance Guyana’s trade and economic interests, especially with our sisters states in the Caribbean Community (CARICOM) and the Union of South American Nations (UNASUR) through vigorous bilateral and multilateral diplomacy. Our Ministry of Public Security will implement policies to secure our citizens from the threat of national and transnational crime, violence and disorder. We will, in 2016, establish an environment of enhanced human safety and public security. The government will continue to place emphasis on improving investigative and detective capabilities and regaining people’s confidence in the Guyana Police Force. We shall equip the enforcement arms of the state with the resources to enable them to serve our citizens and safeguard our independence. The Legislative and Executive branches of government, this year, must work together. This is the year for national unity. This is the year of fulfilling the unrealised objectives of economic independence. This is the year for recommitting to the vision of a free, united and prosperous country – one in which ‘a good life’ is attainable by everyone. We, the elected political representatives of the people, must lead by example. The people of Guyana look to us for leadership. We must open avenues of cooperation and agreement so that we can join hands and hearts for the common good. We invite this honourable House to combine its talents to realise the aspirations and ideals to which we committed fifty years ago. We, Guyanese, chose to change the country’s political culture from the divisive, degenerate and dangerous ‘winner-takes-all’ model to one of inclusionary, participatory, multi-party democracy. We aspire to strengthen national unity, expand national infrastructure, fortify national institutions, ensure national security and extend public services. We shall continue to work to regain public trust by improving and extending education, health, sanitation, water supply, electricity services and, affordable housing to the people. This New Year – 2016 – must bring us closer to the goal of realising our mandate to remake Guyana as the most beautiful, most bountiful and greenest country in the Caribbean. Our mission is to enable everyone to enjoy a ‘good life’ which they deserve as citizens of an independent state. Our aim is to ensure that the ‘Independence Covenant’, conceived fifty years ago, is consummated. Let us come together to realise the objectives of this grand project. Let us together to ensure that 2016 will be Guyana’s glorious year of ‘national renaissance.’ Let us together to grasp the opportunities that this year provides for us – to recapture the spirit of Independence and to secure ‘a good life’ for generations to come. May God protect this National Assembly! May God protect our people! 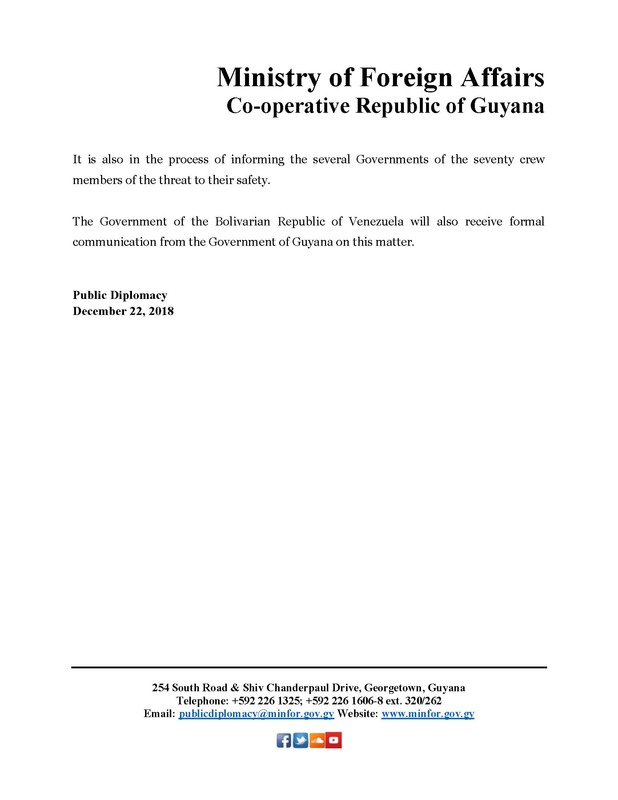 May God protect the Cooperative Republic of Guyana! I thank you.